Okay so you've decided to jump into IGTV. Yes! Congratulations, we need more awesome content on IGTV. But now what? How do you get people to watch your videos? Instagram is doing their best to promote you to your current followers, buuuut… if your followers are “just numbers”, and not an engaged audience who are keen to hear what you have to say, they're not going to be interested in your videos. And if they're not interested in your videos, you're likely to either get muted or unfollowed on Instagram. Ouch! Either way, that means less views. 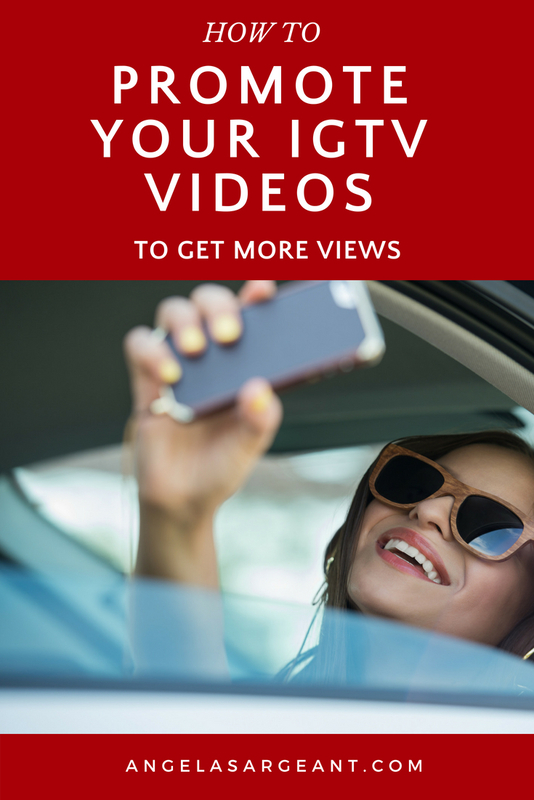 While an engaged and authentic following is a whole other topic we'll cover in another post, today we'll talk about how to promote your IGTV videos to get more views. AND the bonus is you'll get more subscribers and Instagram followers, thanks to IGTV. And of course that means getting your message and your business out to more people. So let's go! There's a couple different ways you can do this, depending on if you're creating your videos exclusively for IGTV, or not. First, let's say your videos are exclusive to IGTV. You can create a very quick teaser video for Facebook that tells your audience you have content exclusive to IGTV and that they can find those videos by going into your account at Instagram. I say Instagram, because not everyone has the IGTV app, so you want to make it as easy as possible for people to find your videos. Let them know there's an IGTV button on your Instagram profile, so they don't have to go downloading another app if they don't want to. You can make more of these teaser videos specifically for certain videos whenever you want, giving your Facebook audience just a taste of what you've recently uploaded to IGTV. Okay, now let's say you don't mind uploading the same video to IGTV and Facebook. You can upload your video automatically to Facebook at the same time you're uploading to IGTV. Facebook owns Instagram, and they desperately want to help boost the number of people watching IGTV. Because of that, they make it super easy not only to share your videos to Facebook, BUT your videos are also shown natively on Facebook. That means when your Facebook fans want to watch your videos, they can watch them directly on Facebook. They don't have to click away. TIP: to get the best out of this feature, you need to click on the “share to Facebook” button at the time of uploading your video to IGTV. Sharing with a link to Facebook after you've uploaded means your followers need to click away from Facebook to see your videos. This is very cool and quick to do. If you created a script for your IGTV video, then simply copy/paste that script into a blog post and embed your IGTV video into the post to give people the option to either read the content or watch it. Of course if you like, you don't even need to have the script, just add a paragraph explaining what your readers will get out of watching the video. Go to your blog post post and (if you're in WordPress) choose “text” at the top of your post, as shown in the photo below. Go to the spot you'd like to embed your video and paste the code there. Just be aware that code from Instagram is huge! So don't worry if you see a whole lot of strange code. Oh Instagram, thank you! Now you can choose to let your followers know you've upload a video to IGTV by sending out a “Story” at the same time you upload your IGTV video. You just select the option to also send to ‘Stories” at the time of uploading your video to IGTV. What happens then is that a screenshot of your IGTV video will be sent to your Story. Anyone who sees your story can then tap on it to be seamlessly taken to your video. This is a super exciting brand new update. In fact it's just rolling out right now as I'm updating this post, which is why I don't have an image to share with you. So you may or may not have this feature as yet. If you don't, then I have another option for you below. In fact, the benefit of publicizing your IGTV video in the way I'm about to explain, is that you can add hashtags to your Story to get even more views. Just like you see teaser trailers for movies, you can create a little trailer on Insta Stories to promote your IGTV Video. Now this doesn't have to be difficult or technical. You can easily create an image on Canva to let people know you have a new story, or you can do a super quick and casual video letting people know why they should watch your video. Now for the cool part! Instagram let's your Insta Story viewers “swipe up” on your Insta Story to go straight to your IGTV video. Swiping up used to be only for Instagram accounts that had 10,000+ followers. But for the purpose of promoting IGTV, anyone can use the “swipe up” feature on their Insta Stories in order to direct people to their IGTV videos. 4. Your videos will now appear on your screen. Choose which of your videos you want to promote and tap to select. This one you'll use a little differently to Insta Stories. With Instagram Live, I would do the regular live video you're planning on, but also talk about your latest IGTV video. Maybe the topic you cover on IGTV goes a bit deeper on a point you make on your Instagram Live video. In this case you can do a “call to action” on your live video to let your audience that they can hear more about this topic on your latest IGTV video. It's kind of like YouTubers add a link in their current video, to promote another video to keep people watching. Remember that prime piece of real estate. Your email signature line. 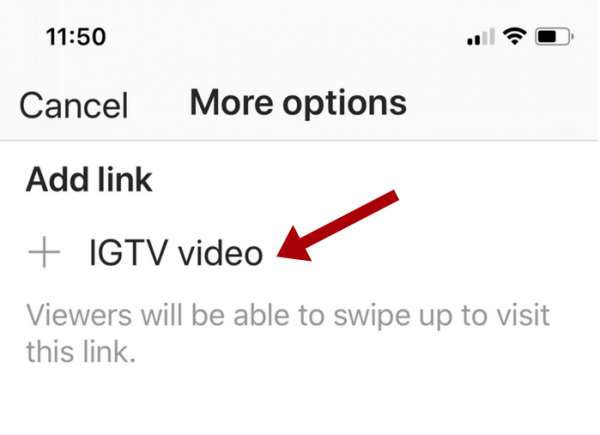 You can promote your IGTV videos by putting a link straight to your channel. The link is: www.instagram.com/YourInstagramName/channel/ – so all you need to do is insert your Instagram User Name after the .com/ and before /channel as I've shown above. Or you can just go to your Instagram page on your desktop, click on the the “IGTV” tab, then copy/paste the URL into your email signature line. This works both on mobile and desktop. 1. Always #1: you're adding value to your email audience. You're giving them some more valuable content to help them with their needs. 2. It gives you another opportunity to connect with your email subscribers. 3. You want to show Instagram you are doing your best to promote IGTV. More people coming in to your IGTV channel, will help you with the IGTV algorithm we just know Instagram is going to spring on us soon. Yes! You can promote your IGTV videos on Pinterest. Okay, at the moment it's not as easy as just clicking on the Pin-It button, but it's still doable. Here's how to Pin your IGTV Videos on Pinterest. Oh, and this can be phone on your phone or computer. 2. Go to your IGTV channel to copy your link. If using your phone: choose the video you want the link to and tap on the three dots at the bottom of your video. This will give you the copy link option. On your computer, go to Instagram, click on your profile and select “IGTV”. Click on the video you want to promote and copy the URL. 3. 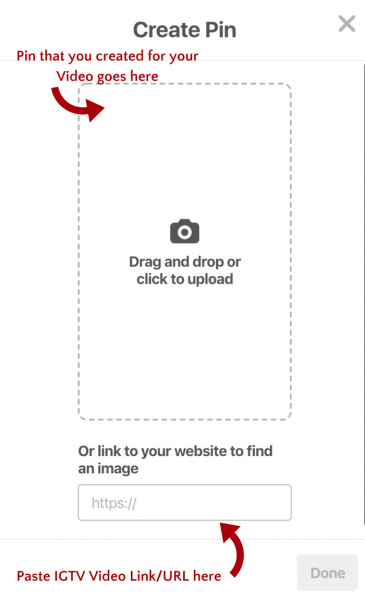 Drag & Drop or Upload your image as shown below. And paste the link/URL to your video below it. 4. Upload your pin and choose the Pinterest Board you want to put your pin in. That's it! All done. Now you can go ahead and re-pin that video to your Pinterest Group Boards too for maximum exposure. The important thing to remember about Twitter is that people don't want to just see a post that says “I've uploaded a new video” and then a link. It's amazing how many people do this, and those sorts of tweets get ignored. Tweet something about your IGTV video topic that will entice your Twitter followers to want to view your video and then add a link. Even better, create an eye-catching graphic to promote your video to Twitter. Not a lot of Twitter followers? That's okay, make sure you use your Twitter Hashtags to get some attention. You also want to remember that Twitter moves fast. So you want to promote that same video again and again. Maybe you're on Quora or other traditional groups and forums. And no doubt you're on more than a few Facebook groups. These are great places to promote your videos. Before you go jumping in though, a word of advice: no one likes reading promotional posts. When I say promote your videos on groups, I mean in a very natural and helpful way. And only IF the the rules of the group allow it. And only IF you already actively participate in the group without promoting yourself. Here's two genuine ways to approach this (again, if it's within the group rules that you can post outside links). 1. Take note of conversations that have been happening lately. If you find that people have been taking about a subject that you've created a video on, then go ahead and start a post by saying that you've noticed a lot of questions around a certain topic, and you're sharing a video you create which they might find helpful. 2. Watch the conversations as per usual and participate genuinely. When a post comes up where your video would be helpful, then add a comment saying that you have some helpful thoughts on that subject, and link to your video. Promoting your videos in group in this way, is the same as a natural conversation with a friend where you recommend something or give advice. Whereas jumping in and promoting without conversation, is a lot like that pushy sales person, that we just know cares about nothing else but pushing a sale. No one wants to be that person. So there you are! Lots of options for you to promote your IGTV videos. Now if you're having an issue with your social media strategy converting followers into warm leads, feel free to give me a yell. I'd love to hear what you're doing with your business at the moment on Instagram and IGTV, and give you a free mini social media overview to help you get on the right track. Greta article Angela! Thank you very much for the practicality. Just about to launch my IGTV channel, so it helped me a lot. Thanks so much Makar! I’m super happy you found my blog post useful. Good luck with your IGTV channel, I’m sure you’re going to enjoy creating those videos. Thank you so much for visiting Clive! I’m thrilled you found my blog post useful.